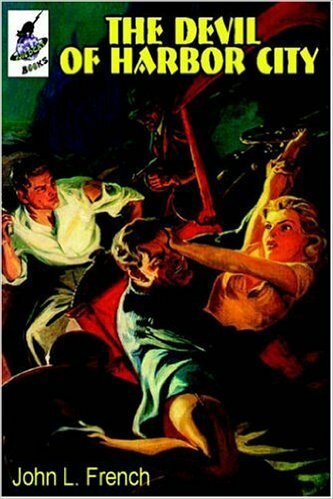 This collection of stories has crossover connections to other pulp characters, as well as one of the author's own New Pulp characters. In "Enter the Devil," the Harbor City police commissioner asks Officer Frank Devlin to become a vigilante. Devlin replies, "Well, now, do you want me dressing up as a bat or a spider or something? Or should I just blend in with the shadows?" The Commissioner replies, "Criminals are a superstitious and cowardly lot, but I’d rather them be afraid of a crazy cop with a license to kill." Devlin is referring to Batman, the Spider, and the Shadow. In "Deal with the Devil," Sergeant Benjamin Campbell dismisses the idea of Devlin hiding in darkness: "That was what that guy in New York would do. Devlin’s not one to play with shadows." The Police Commissioner introduces Devlin to Michael Shaw, a New Yorker who owns a private investigation agency, whose services he has enlisted to clean up the courts in Harbor City. Shaw refers to underworld hangouts in New York such as the Pink Rat and the Black Ship. 'That guy in New York" is the Shadow. The Pink Rat and the Black Ship are underworld dives from the Shadow novels. Michael Shaw operated in the 1930s as the vigilante called the Nightmare, as seen in a series of stories by French. In "The Devil's Wake," Devlin is apparently killed by men working for New York City gangster Wolf Hopkins. Hopkins planned his attempt on Devlin’s life with a Harbor City crook at the Red Thorn in New York, which has the same reputation as the legendary Pink Rat and Black Ship, bars where the police dare not go. The Police Commissioner, Sergeant Benjamin Campbell, and private investigator Michael Shaw attempt to avenge Devlin’s death, but he turns out to be very much alive. In the 1930s, Wolf Hopkins was the archenemy of the Nightmare. In "Devil's End," Devlin finally ends the menace of Wolf Hopkins. Afterwards, he and his bride-to-be Angela Martinelli accept a job with Michael Shaw’s private investigation firm.